Nourish, condition and strengthen your lashes with the DHC Eyelash Tonic, an easy-to-use serum made from beneficial bontanical extracts. The award-winning formula helps to intensively restore lashes that are prone to breakage, working to reinforce them from root to tip. A cocktail of energising ginseng, soothing aloe and swertia japonica, a stimulating Japanese flower, work together to give you a healthy-looking fringe of lashes. Watercress and comfrey seal in moisture to help decrease breakage. Easy to use, simply sweep a small amount of Eyelash Tonic through your lashes and wait to dry. The versatile formula is perfect as a mascara base in the morning, and as a treatment overnight. 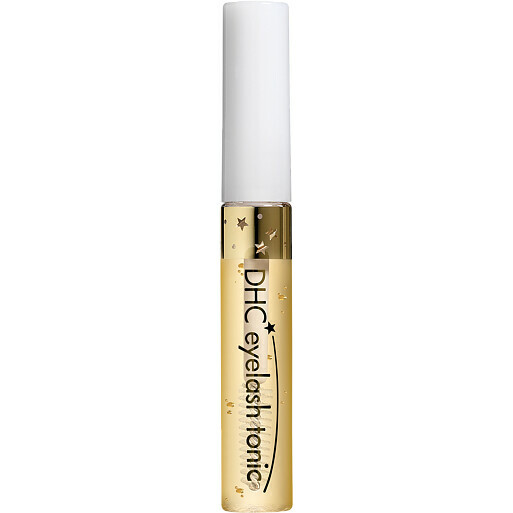 DHC Eyelash Tonic - Eyelash Conditioner 6.5ml is rated 4.5 out of 5 by 10. Rated 4 out of 5 by Riaaa from Great stuff but don't expect life changing results I've been using this tonic for about a month, and I can definitely say it conditions your eye lashes well and even makes them a little bit more prominent. I think it's a great product for a day to day use, but if you're looking for a serious improvement of your eyelashes I don't think this tonic will help. Still a good product and I quite like using it as a primer for my mascara. Unfortunately, I don't think the tonic will last long, as I'm already half way trough the bottle, though it's only been a month. Rated 5 out of 5 by Trendynanny from Eyelash tonic. My eyelashes were seeming very brittle and dry. Started using this eyelash tonic and already after two weeks can see an improvement in them. Fuller softer and looking much better. Rated 4 out of 5 by kiki3 from Lovely If i'm really honest initially what attracted me most to this product was the price. I'd been looking for a product for my eyelashes - I personally used to have very long, thick eyelashes until the eyelash extension craze came about, now my eyelashes look and feel sparse and weak in comparison. I wasn't expecting much out of this product but was pleasantly surprised. I use this both in the morning and evening on squeaky clean eyelashes. Although i haven't seen any difference in the fullness of my natural lashes i have seen a difference in the condition of them, they look more glossy, conditioned and healthy. Probably one of my favourite things about this product is the way it works with my mascara. If i apply the eyelash tonic a little while before applying my mascara when the time comes to apply mascara the application process seems so much easier and the results are lovely. My eyelashes look fuller and less sparse, i feel the tonic becomes almost tacky when i apply mascara over the top of it, i can achieve full, thick looking lashes in near to no time. I rated this product four stars instead of five as i haven't seen any difference in the growth of my lashes. Rated 5 out of 5 by peach from Lovely!!! love this tonic, it goes on very well and makes your eyelashes feel long, thick and healthy.